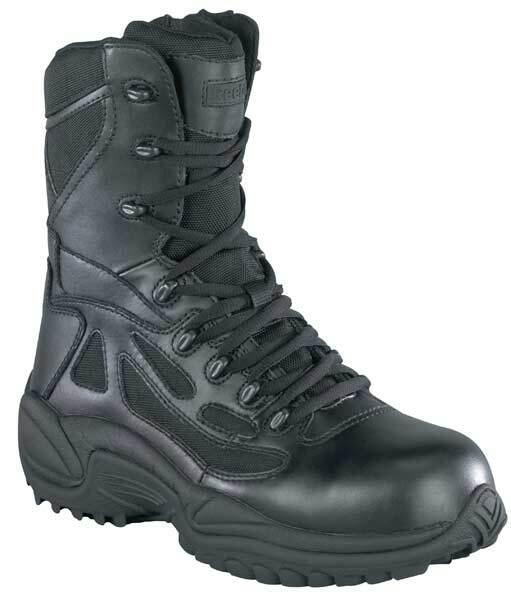 The 8-inch Reebok Rapid Response Waterproof Tactical Boots are lightweight boots with an athletic comfortable fit. These Reebok Boots have superior cushioning and shock elimination so you get cushioning comfort with every step. Research has shown this will save your feet and legs from injury. The Reebok RB8877 black Uniform Boots have virtually no break in period so you will not deal with inflexible boots that give you blisters, tired legs and hurting feet. Whether you're running across a black top or a slippery floor, the Reebok Rapid Response boots will deliver. Construction features of the Reebok Rapid Response Uniform boot include full grain leather and 1200 denier nylon uppers with high abrasion and slip-resistant non-marking dual density outsoles. The parts you can't see on these black Uniform boots are equally important: non-metallic shanks, dual-density ball and heel cushion, and Reebok Shock Eliminator technology that lets the tactical boot take the pounding, not your feet. The waterproof breathable membrane will keep you completely dry in any weather condition. Removable Footforce comfort insole in the Reebok RB8877 tactical boot provides arch support and heel stabilization to keep leg and back pain at bay for hours. Non-metallic lacing hardware will not rust or corrode, and allows rapid on and off. 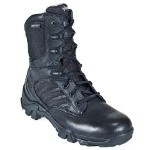 This boot was previously known as the Converse C8877 Rapid Response Tactical Boots. Black Full Grain Leather and 1200 Denier Nylon Upper.